The center of the former Roman “Provincia Fallia Narboniensis” forms the Bas Provence around the city of Avignon. It is one of the oldest cultural landscapes of Europe and has written world history more than once. During the schism of the medieval church, alongside the Pope in Rome there was another one, residing in Avignon and shaping the city and region. Ancient towns nestle in the mountain wilderness, deserted villages are being reclaimed by nature. 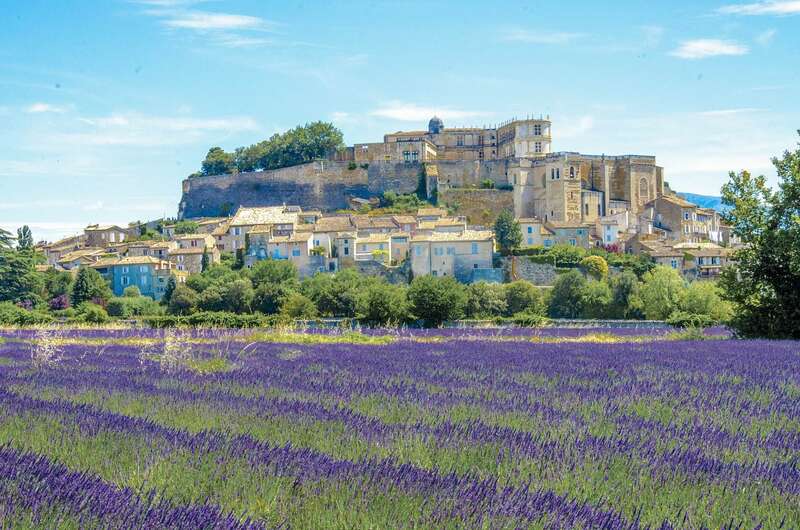 In addition to cities such as Arles, Nimes or Aix visitors can find almost untouched landscapes: Mont Ventoux, the highest massif of the Provence or the endless oak forests of the Luberon. Considering the pleasant Mediterranean climate, it is understandable that this land has always attracted travelers, painters and artists. 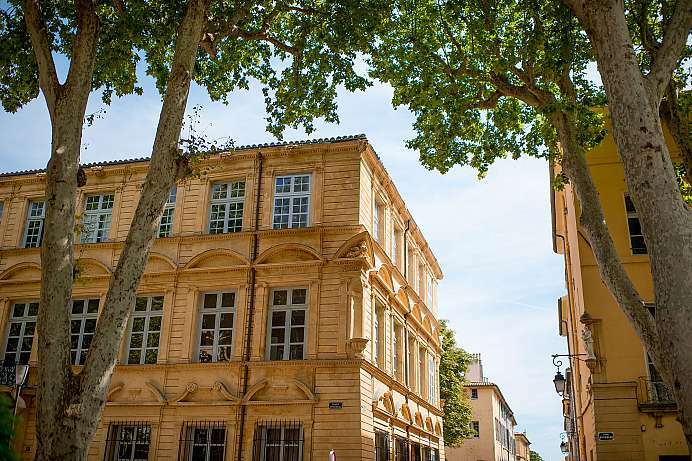 The former capital of Provence is considered one of the most attractive cities in France. Founded by the Romans in 122 BC, the ancient city is known for its elegant palaces in Italian Baroque style, its magnificent tree-lined avenues and its vibrant atmosphere. The city is split in half by the Cours Mirabeau, a wide thoroughfare lined by fountains, cafés and historical buildings. One of the most famous cafes in all of France is Lex Deux Garçons, once frequented by the likes of Cézanne and Hemingway. The city originally famous for its hot springs boasts 300 days of sunshine a year. One of the oldest cities in the Rhone Delta, Arles was founded by the Greeks in the 6th century BC, then captured by the Romans in 123 BC, who turned the settlement into an important city. 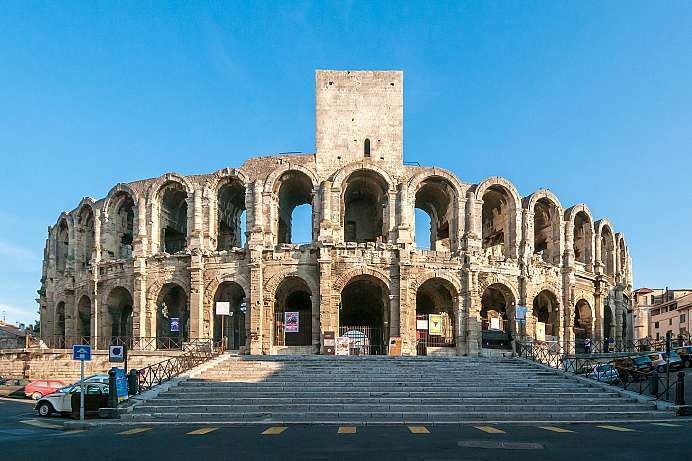 Arles enjoyed its greatest period of influence during the 4th and 5th centuries, when it served as the headquarters for Roman emperors conducting military campaigns. The numerous Roman and medieval remains in the city center have been named a World Heritage Site by UNESCO. Van Gogh painted many of his most famous pictures in Arles, which is also considered the gates to the Camargue Delta, the habitat of the Greater Flamingo and the white Camargue horses. Today, the city east of the Rhone has less than 100,000 inhabitants. In the Middle Ages Avignon was a city of international standing. From here seven popes have reigned the Occident during the schism from 1309-1376. At that time the town was a brilliant art center. 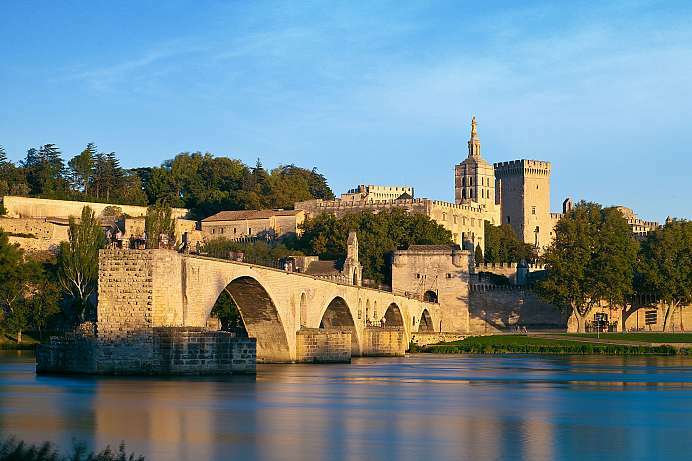 The “City of Popes” was able to keep its city walls around the old town, the Palace of the Popes, the Bishops' complex and the bridge of Avignon undamaged to the present day. The old town of Avignon is a UNESCO World Heritage Site and was European Capital of Culture in 2000. At the mouth of River Rhône, the Camargue is the largest river delta in Europe. The wetlands are mainly suitable for vegetable, fruit and rice cultivation. In the south of the Camargue there is a 13,000 hectare nature reserve located around the Etang de Vaccarès, which is one of the typical shallow lakes with countless water birds. 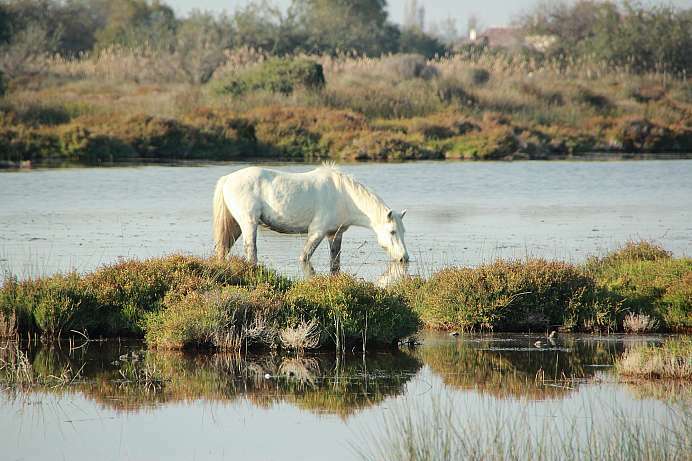 Wild horses and large herds of Camargue bulls live in the reserve. On the coast, the town of Saintes-Maries-de-la-Mer boasts a fortified church from the 9th century. This town, which is surrounded by gently rolling hills, served as the summer residence for the popes of Avignon during the Western Schism in the Middle Ages. The castle ruins, which include a tower and segments of the wall, are reminders of this era. 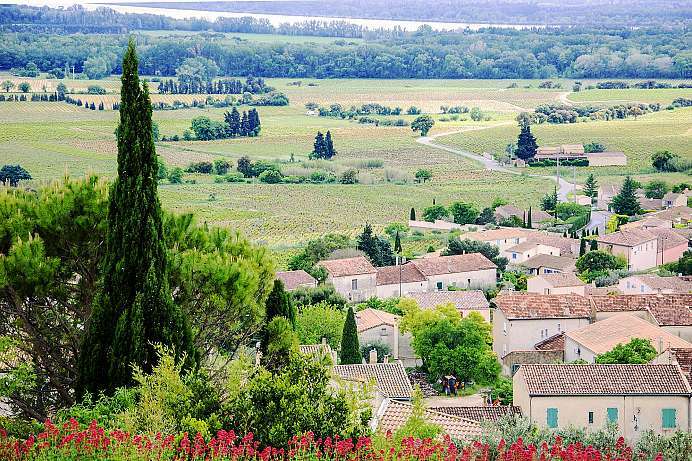 With a population of 2000, the town is now at the heart of a world-renowned wine producing region where you can enjoy touring wine cellars and tasting the wine. The city on the Gulf of Lion is the oldest and 2nd largest city in France. The original settlement was founded by Greek traders in the 7th century BC, and quickly grew into a colony along the mouth of the Rhone River. The port lost its significance, however, after the collapse of the Roman Empire, only to return to strategic importance 500 years later during the crusades. 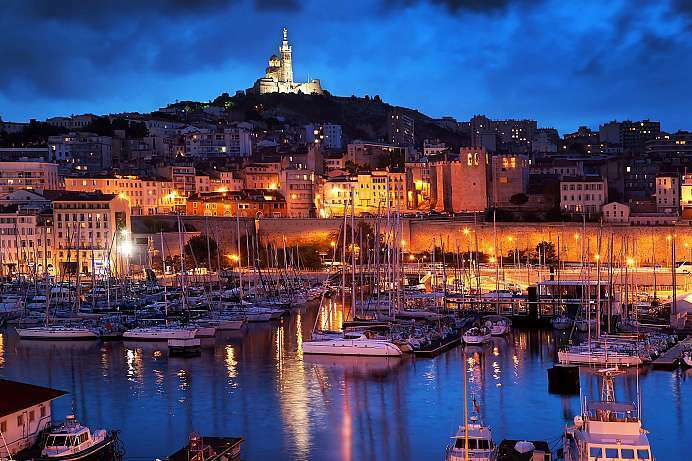 Marseilles grew into a true multicultural metropolis during France's colonization of northern Africa. Worth seeing is the Old Port (Vieux Port), which includes most of the original Greek settlement and is now an exclusive marina. The best preserved Roman amphitheater is located in southern downtown Orange. 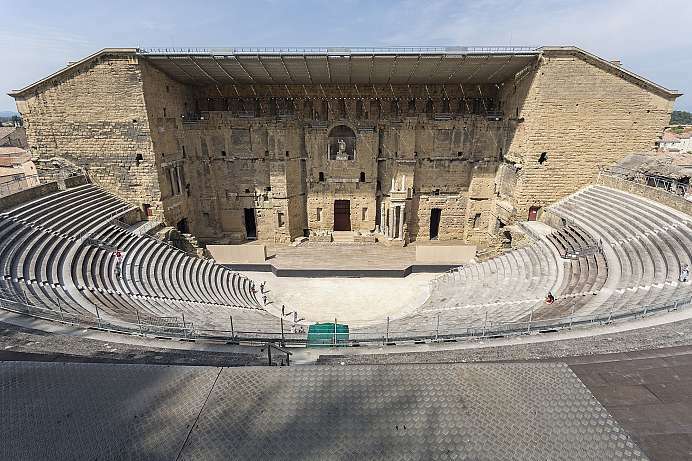 Constructed of massive stone blocks, it is also one of the most beautiful Roman amphitheaters. The theater was built in 40 BC to hold 7000 visitors and was meant to both spread Roman culture and distract from political events. Its condition deteriorated during the rise of Christianity and it was later used as a fortress during the Middle Ages. Shows and concerts have been held here regularly since the 19th century.